Compact fluorescent light bulbs are produced to conserve energy, unlike their incandescent counterparts. For example, a 13-watt CFL is manufactured to replace a 60-watt incandescent, using only 22% of the power that the incandescent needs. Also unlike the incandescent, CFL light color and light brightness are based on lumens and color temperature, not wattage. These both should be taken into consideration when choosing an incandescent replacement. The amount of light emitted from a compact fluorescent bulb is based on lumens. The chart below shows the amount of lumens necessary to achieve the same light brightness as an incandescent. The light color of a compact fluorescent light depends on temperature, which is measured in degrees Kelvin. The lower the Kelvin number is, the â€œwarmerâ€ the light color of a bulb will appear. For example, a compact fluorescent light which measures 2700K will give off a warm glow, similar to that of most incandescents placed in living rooms and bedrooms. At 3500K to 4100K, the color is more of a soft to cool white, suitable for kitchens. A CFL with 5000K provides a light color comparable to the light of the sun at noon. This light color is more appropriate for tasks such as painting where close attention to detail is required. 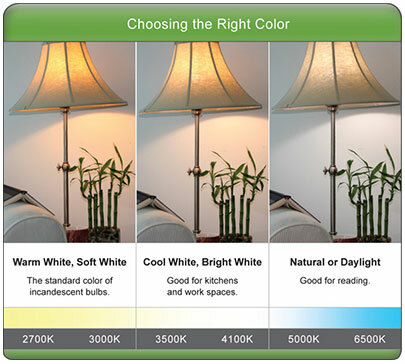 The picture below from DTE Energy will help you see the difference in color as the temperature changes. Understanding light brightness and light color are important to choosing the correct replacement for the energy abusing incandescent lights in your home.